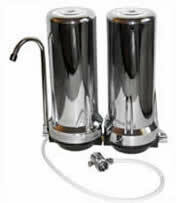 Clean water is the lifeline to good health and CuZn Radioactive Water Filters provide the best possible water for cooking, drinking and washing every time you turn on the faucet by filtering radioactive water contamination from strontium, uranium, plutonium, cesium, iodine and other radioactive contaminants, and iodide to a lesser degree, from city or well water based drinking water. CuZn water filtration don't stop there. CuZn's standard water filter cartridge works on any home or office sink countertop or under-counter to filter up to 8,000 gallons of cold water on demand! This housing uses a combination of patented trace minerals (Copper-Zinc) which has been tested to NSF standard 42 and 61, and acid wash coconut shell carbon. This system will remove and/or reduce chlorine, sediment, algae, molds, scale, bad taste, odors, and other undesirable contaminants that may effect the quality of your water supply. And unlike carbon only filters, bacteria can't grow inside the bacteriostatic CuZn filters.